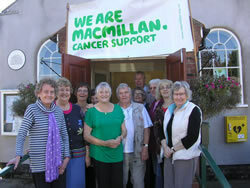 A Macmillan Coffee Morning took place this year on Saturday 26th September in the Recreation Room on a gloriously sunny autumnal day. 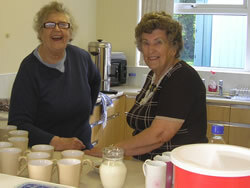 The event was organised once again by Mrs Marion Brown and her cheery band of helpers. 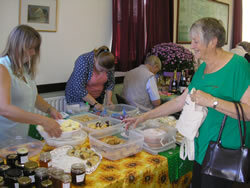 The ever popular "Make and Bake" stall was run by Marion’s daughter Jo and grandaughter Becky. The table was laden with many delicious home made cakes, sausage rolls, quiches and preserves, all donated by village residents, friends and family. The raffle was run by Pat and Brian Suart. Prizes included a specially made cheeseboard complete with knives and a selection of cheeses, tin of biscuits, chocolates, several bottles of wine, cosmetics, a beautiful large potted Chrysanthemum, a meat voucher, a facial voucher and much more. The Prize Bingo, another favourite stall, was run by Pearl Lockwood and Don Brown, with prizes including, a race day voucher for two, wine, drawer liners, carriage clock, chocolates, an Asda voucher, a hors d’oeuvre tray and more. 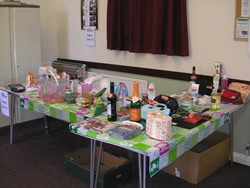 The tombola run by Val Turtle and Maureen Graham, had many varied prizes which went quickly this always being a popular fundraising stall and usually the first to empty! The “New to You” stall was run by Beverley Taylor and her daughter Kirsty. There were lots of different items of bric-a-brac including books, china, knitted items, bags, kitchenware, a singing cuddly dog, a neighing horse, 2 pouffes and much more. 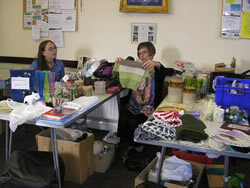 This year there was also a Phoenix Trading stand selling some of their many products. A donation was made by them to the event from their proceeds. This was organised by Angela on behalf of Caroline Thomas. Refreshments of tea, coffee and biscuits were available throughout the morning, organised by Kath Long and Shirley Wilson, always with a smile and a cheery word. Individuals and businesses who donated to the event included – Southwell Racing, Salts Medical, Boots Chemist, Wayne Howe Butchers, ASDA, Sophie Markham, Wilko, Retford & Gainsborough Garden Centre, Sunrise Plant Company, and others. 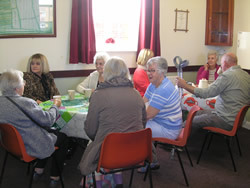 Many goodies were also generously donated by village residents, friends and family along with some great baking. Sincere thanks go especially to Marion for all the hard work organising and to all those who helped in any way, donated and attended making the event a success. 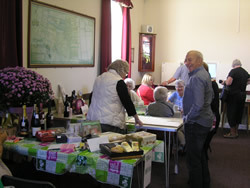 It was well attended and the total so far is £827.01p.